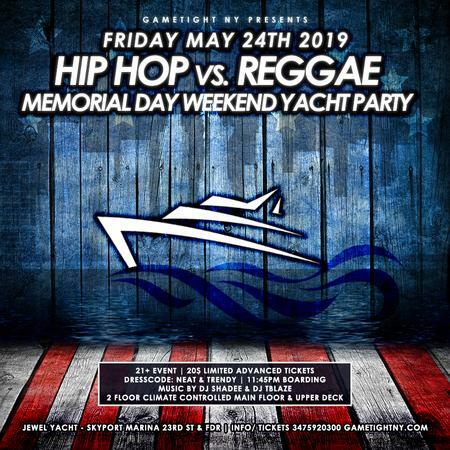 Friday May 24th, 2019 – New York City Hip Hop vs. Reggae Memorial Day Weekend Yacht Party Cruise at Skyport Marinas Jewel Yacht. Friday May 24th, 2019 – New York City Hip Hop vs. Reggae Memorial Day Weekend Yacht Party Cruise at Skyport Marinas Jewel Yacht located at 2430 Fdr Drive Service Road East New York, NY 10010. Join us this MDW 2019 the Hottest Hip Hop vs. Reggae Friday Cruise in New York with NYC Hottests Djs Each & Every other Friday!